If you are looking for information on the Cookies & Cream franchise business opportunity, Cookies & Cream franchises or Cookies & Cream franchising, then you have come to the right place. 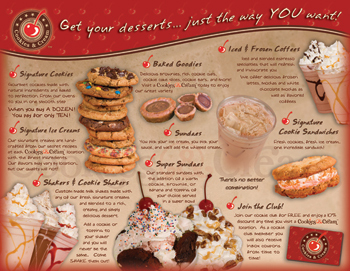 Cookies & Cream, Inc. was born from our desire to do dessert better! Our combined 15 + years of food industry and business experience, helped us realize that we could create a superior dessert destination. At Cookies & Cream we are dedicated to using the highest quality, natural products to create our amazing desserts. 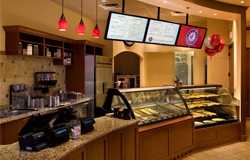 Our shops provide gourmet treats in a warm, inviting, friendly atmosphere. If you decide to become part of our growing concept, we are 100% committed to offering you a great experience. Franchising opportunities are now available! The concept of Cookies & Cream was developed with simplicity and functionality in mind. We offer an exciting opportunity for anyone with or without business experience to share in our success, and become part of our extended family. Our franchisees will enjoy a level of support that is "anything but standard" in the franchise industry. We will offer you assistance in the process from the very first steps of choosing your location and designing your store, to negotiating favorable lease terms, securing accounts with vendors, full product training and ongoing support of your day to day operation. We pride ourselves in YOUR success and will optimize your Cookies & Cream experience so that we can grow together as business partners and you can become as successful as you desire to be.